All three of my sons play football, so I’m a very busy spectator, this time of the year. Vancouver is the perfect project for my purpose – simple enough that I can blast through the stockinette portions without missing any action on the field, yet interesting enough at some points to make it appealling to a geeky knitter like me (or you, perhaps?). And, it gets me into the Olympic spirit…even if I am just lollygagging on the bleachers. I’ve read the pattern through and it seems pretty straight forward. However, there are little things here and there that I thought I’d mention to you; things I’ll tweak a bit in mine that you might want to consider, too. Obviously, my yarn color is different, too. Had to be! (BTW, that’s Daletta “mist” 2425 you see there. Nice, huh?! I’ve also made one minor change in where I put my markers, but I’d like you to consider it, too, for I think it makes things a good bit more foolproof. I know it will save me from a fair bit of frogging! The pattern has you place one marker right in the middle of each side. Actually, with the ribbed panels going up the side, it’s super easy to see right where the middle of each side will be. The real issue, to my mind anyway, is knowing immediately when to switch from stockinette stitch to ribbing and when to end the ribbing and revert back to stockinette. It would really be nice to know that in real time, rather than several rounds after I goofed! Rather than use one marker at each side, I use two – one on each end of the ribbing. Plus, I color code them – red (ok, magenta) means “Stop the stockinette!”, green means “Go back to stockinette!”. And, dahlink, I just know you love my high-end stitch markers, yes?! 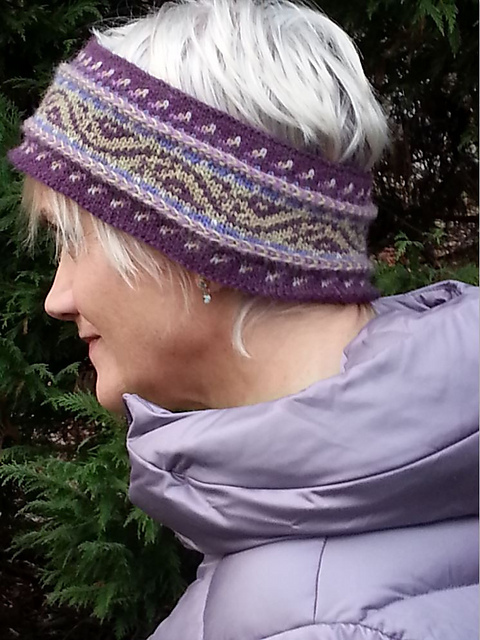 This entry was posted in Knitting, New From Dale of Norway, Technique, Uncategorized and tagged Dale of Norway, Knitting, knitting project, nordic, norwegian, olympic knitting, olympic sweater, Vancouver. Bookmark the permalink. Have you been able to purchase the patch that goes with the sweater? Sure! They’re $2 each. But, I’m happy to include one for free whenever someone is buying both the yarn and book from me for their Vancouver and they mention they’re interested in the patch, too. There are two Vancouver patches – the bigger one is used on the chest of the adult unisex crewneck; the smaller one is used on the sleeve of the ladies’ v-neck and on the kids’ sweaters. By the way, there are several Dale of Norway things that I have in stock that just haven’t made it up to the site yet. For instance, I always have all the current books in stock, for I’m on their “autoship” program; it just takes an eternity for me to scan the photos of the designs within the books, so there’s sometimes a delay in getting them up there. Not only that, that pesky webmaster of mine (aka husband, technogeek, commuter, landscaper, electrician, plumber, kids’ football coach…) tends to get mighty busy with non-Kidsknits-related tasks (the nerve!) But, hey, he works for peanuts so I can keep prices low – yeah!